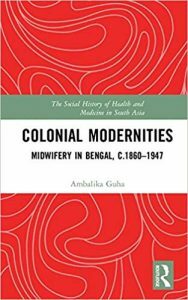 Ambalika Guha has produced an excellent study on the powerful interplay between colonialism, nationalism, modernity, medicine and midwifery in colonial Bengal (c. 1860-1947). Unlike the dominant scholarship in the field, Guha emphasizes the roles that both male and female doctors, and not female doctors alone, played at the pedagogic and interventionist levels respectively in the development of midwifery and obstetrics in Bengal (pp. viii-ix). She highlights the centrality of the vernacular medical and popular print media in the gradual development of the Bengali middle-class ‘respectable’/bhadra identity, primarily the bhadramahila as the ‘new woman’. She provides invaluable insights on Bengali medical and popular manuals, especially the role of the popular women’s magazine Bamabodhini Patrika in ‘home tutoring’ of the bhadramahila in domestic management, midwifery, pregnancy, childbirth, motherhood and childrearing. She mainly focuses on why and how nationalist politics and institutions like the Calcutta Medical College and the Calcutta Municipal Corporation brought pregnancy and childbirth to the centre of nation-building endeavours. Her main argument is that reforming midwifery meant ‘modernising the middle-class women as mothers’ which was ‘essentially a modernist response of the western-educated, colonised middle-class to the colonial critique of Indian sociocultural codes’ based on the ‘nationalist recognition of family and health as important elements of the nation-building process’ underscored by transnational discourses on eugenics and ‘racial regeneration’ (pp. ix). Bengali men’s insecurities regarding their stereotyping as ‘effeminate’ and ‘frail’ coupled with the pull of new medical-scientific, often pseudo-scientific, discourses on health amidst a flourishing vernacular print market brought to the fore heated debates about the body, including male and female/maternal bodies in connection with child marriage. She emphasizes on contemporary anxieties concerning the Hindus as a ‘dying race’ amidst communal tensions and fears of a growing Muslim population. Sources used like UN Mukherji’s Hindus: A Dying Race (1909), also discussed earlier by David Arnold in relation to malaria, ‘race’, science and colonialism; stress on the communalized logic in anxieties regarding the ‘diminishing vitality of the nation’ (p. 116). This discussion on ‘immature’ maternity would have also benefitted from an in-depth investigation of the reports on native newspapers of Bengal, which give interesting snippets of information, especially about the age of consent debates (1890s-1920s) and the sometimes-contradictory worldviews of indigenous medical practitioners in this regard. Guha explains that the western medical paradigm, despite its commingling and hybridization with local medical traditions, remained central to the ‘transition of midwifery from a cultural phenomenon in the nineteenth century to an overtly westernised and professionalised science of obstetrics in the twentieth century’ (p. 4). She traces the new forms of knowledge and epistemic shifts back to the establishment of the Calcutta Medical College and the introduction of different courses on clinical anatomy and midwifery. She points out that following the establishment of the CMC in 1835, midwifery was incorporated in the College syllabus in 1841, and finally a Bengali class was started in 1851 to incorporate indigenous male medical students, which, in 1864, came to be split into an apothecary section, and a vernacular licentiate section to benefit the rural countryside. She argues that in Bengal, the medicalization of childbirth was preceded by the incorporation of midwifery in the CMC curriculum under the supervision of the CMC faculty comprising British and indigenous male medical practitioners which, coupled with several developments, eventually led to the growth of obstetrics as a specialization [see detailed discussion on the famous Bengali obstetrician, Kedarnath Das, who reconfigured western medicine (mainly the forceps) to the local Bengali socio-cultural environment (pp. 88-91)’.] Building on Projit Bihari Mukharji’s arguments on the figure of the (male) daktar or indigenous medical practitioner of daktari medicine or ‘provincialized’ and ‘vernacularized’ western medicine (p. 83), her book further delineates their major contributions which, she argues, were usually confined to the discursive realm of maternal and child welfare. She also discusses in detail the contributions of the Calcutta Municipal Corporation together with its novel midwifery schemes with the help of public health officials or health visitors like home visiting and domiciliary midwifery services which drew lower middle-class populations within the fold of standardized professional maternal care (p. 188). Her book also points out the more commonly known fact that the development of midwifery as a specialized branch of ‘scientific’ practice included the hands-on experience and intervention of female doctors (who often ended up echoing the professional ethos of the ‘male-controlled medical structure’ (p. 75), as midwives were only trained with lessons on cleanliness and how to recognize abnormal labour, instead of ‘operative midwifery’ (p. 74), so that they could call the doctor in time. Guha also discusses ‘scientific’ midwifery and how it carved out a space together with the burdensome ‘trope of motherhood’ and the western concept of ‘mothercraft’ (medicalized motherhood) in Bengali nationalist medical opinion. This work delves into the problem of infant mortality through a brief exploration of primary and secondary sources related to the ‘trope of maternal ignorance’ (p. 17), which runs through the book. She highlights that ‘[d]espite the role of the mother being redefined in national terms, maternal ignorance was trolled in the media as a major factor affecting mortality rates’ (p. 113). In relation to the measures to alleviate the high infant mortality rates and to contextualize instruction and initiatives on maternal and infant care in early twentieth century colonial India, there is a discussion on the semi-official organization, The Lady Chelmsford All India League for Maternity and Child Welfare, coupled with the voluntary Red Cross Society, and finally the Rockefeller Foundation aided All India Institute of Hygiene and Public Health (AIIHPH). She combines this with an examination of efforts by mahila samitis or women’s organizations like the Saroj Nalini Dutt Memorial Association (SNDMA), a middle-class women’s organization founded in 1925, and its mouthpiece Bangalakshmi which revealed its expanding networks at the village and district levels conducting lessons in health, hygiene, midwifery, and so on (p. 121). Colonialism together with state apathy and lack of financial support towards maternal and child welfare as late as the 1930s oddly coexisted with growing Bengali ‘hospital-mindedness’ (p. 189). She closes with considerable food for thought in her afterword on the postcolonial development of an urban-centred, doctor-based health care system (p. 191), primarily based on ‘the hegemonic grip of western-style midwifery’, which resulted in the ‘urban middle class penchant for institutional delivery and modern maternal care’ especially in Calcutta (p. 193). Guha’s Colonial Modernities is a pleasure to read. It provides a detailed historical problematization and analysis of the very constitution of the Bengali medical discourse on ‘scientific’ midwifery in the course of the nineteenth and early twentieth centuries. The problems probed by Guha are of considerable relevance to graduate students and social historians studying gender and health in colonial Bengal. Ranjana Saha is a research fellow at the Indian Institute of Science Education and Research, Mohali. She has recently published articles in South Asia Research and Women’s Studies International Forum.